This wind tunnel generates an airstream (60m/s max.) in a transparent test section (300 x 300 mm). Different accessories (aerofoil section, static tube) can be installed in the test section to test the subsonic aerodynamic laws. 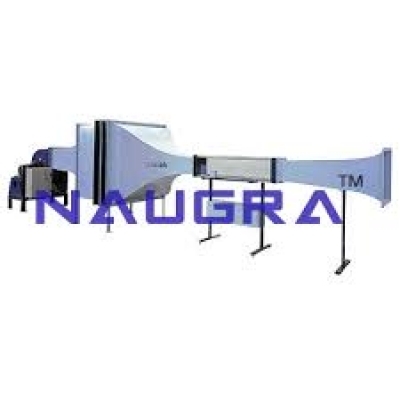 This wind tunnel has a reduced volume and is fitted into laboratories and test floors without necessitating installation or civil engineering works. It allows some very demonstrative experiments in aerodynamics to be carried out, such as. Measuring the speed of air flow and plotting speed profiles in different sections of the wind tunnel test section. Measuring the distribution of pressure on the underside and upper side of an aerofoil section. Study of the distribution of pressure around a cylinder. Measuring lift, air resistance and lift moment with an aerodynamic balance, 2 or 3 components on different aerofoil sections according to the incidence (complementary equipment). A test section comprising two vertical glass surfaces, one of which is entirely hinged to allow access to the interior of the test section. The upper part has a lengthwise slit fitted with joints to allow a probe to be attached. A movement system with one, two or three axes can be inserted on the test section. A plenum chamber, area 2.25 m², fitted with a filter bag, a honeycomb and 3 grids of bronze wire gauge. A nozzle, assuring an excellent quality of air flow at the entrance to the test section. It has been designed bidimensionally, considering a pressure flow, with correction of the turbulent boundary layer. A diffuser downstream of the test section allows an important part of the pressure loss to be recuperated, and allows renewed disturbances in the airstream to be avoided. A high performance centrifugal fan is driven by an induction motor. The adjustment of the fan’s rotation speed is carried out thanks to a frequency variator. Fine dust removing filter bags (Ashrae gravimetric efficiency 97.5%). Three grids in bronze wire gauge. A honeycomb, thickness 90 mm, 8mm mesh. A trolley mounted on rails can accommodate a vertical moving unit for sensors. The wind tunnel is completely made from painted sheet metal. Aerodynamic test section: 300 x 300 x 1500mm (area, length). Variable speed between 3 and 60m/s. Variation of total pressure: below ±0.50%, hence speed below ±0.25%. Turbulence intensity on the U component: 0.15%. Motor power: 12kW at 2000Vm. Aerodynamic balance 2 components and 3 components. 8300 x 1950 x 2250 mm and 450 kg (approx. ).